Weddings are events surrounded by mystery for young children. We look forward to the excitement and fun, but sometimes feel a little left out. In this story, we learn how one tradition within the Eastern Indian community deals with that feeling. This is, after all, the first wedding Sona has ever attended. The young sister of the bride is given the task of stealing the groom’s shoes during the ceremony. This seems like an odd task until you realize he will take his shoes off for the ceremony. If she is able to steal his shoes then he must bargain with her to get them back. This seems like a lovely tradition intended to help bring the siblings of the new family together. Sona is nervous, of course. She can’t think of any way to steal his shoes during the ceremony for a long time. But, in the end, she is successful. Readers will wonder what she will want to bargain with the groom for to get his shoes back, some will already know what she wants. Included in this story of tradition, is the painting of hands and the application of kumkum on the forehead of the groom for good luck. Parts of the wedding ceremony itself are included such as praying to Lord Ganesh and having the priest tie together the sashes of the bride and groom. The illustrations of traditional clothing, garlands and surroundings are stunning. The watercolors are bright and authentic. It is a truly beautiful book. 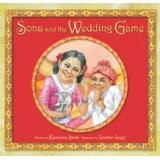 Teachers, librarians and parents of elementary children will enjoy this look into the wedding traditions of East Indian Americans. Second grade and third grade classrooms can fulfill the core curriculum standards for literacy, art, culture, history, and traditions by using this beautiful book. There are also several vocabulary words introduced in the text that would be familiar to some children of East Indian descent, although the author’s note is quick to say that India is a large country and not all the traditions are kept the same in every region. Still, this is a beautiful look into a world we may not all have visited yet. Extras: Author’s Note further describes the wedding traditions and tells a little bit about how they are changing over time.